Edita Gruberova essentially revived and propagated the bel canto repertoire in central Europe, specifically in the German-speaking countries. Her influence in this realm has resulted in opera houses in this region putting these works in as part of repertory staples. When the Vienna State Opera mounted a new production of Lucia di Lammermoor for her in 1978, it had not been heard there for decades. In addition, stagings of Maria Stuarda, Anna Bolena, Roberto Devereux, La sonnambula, Linda di Chamounix, I puritani, La fille du régiment, Semiramide, Beatrice di Tenda, La straniera, I Capuleti e i Montecchi, Lucrezia Borgia—all made their way into the German-speaking countries (and beyond) either in first-ever appearances, or for the first time since the 19th century because of Gruberova’s status and box office power. Only Il barbiere di siviglia (Gruberova’s first operatic role in 1968, in Banska Bystrica, Slovakia) and Norma had any kind of currency in these regions, albeit only fitfully. 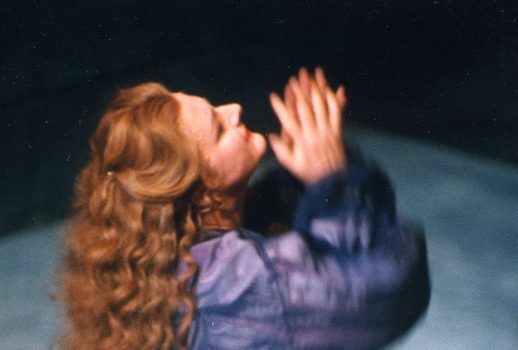 Gruberova’s foray into bel canto effectively began in Graz, Austria, in 1975, for two performances of Lucia (each 11 months apart). Her Edgardo was the legendary Carlo Bergonzi (the December 12, 1975 performance, recorded by a fan of the tenor’s, exists in pirated form). Though Gruberova has won several Italian awards for her singing in the bel canto repertoire, her very association with Italian opera has severely divided critics and opera aficionados alike. The here-acknowledged consensus among her critics is, to be specific, that the voice lacks Italianita, the approach often cited as being too “Viennese,” namely, that she slides and scoops into the upper interval of notes rather than springing up to them. Too, that her middle-lower region lacks core strength and pungency. Many cite “squeezing” and “straightening” of the tone at times. To the supposed lack of an “authentic” Italian style, I can only respond: opera is an international art form. I was reading just recently how far the opera Norma traveled quite soon after its 1831 premiere: it was given in German, English, Hungarian, Russian, Czech, Danish, Swedish, French, and Polish translations in their respective countries. I would be willing to wager that few complaints were made about corresponding lack of so-called Italian singing values. Prior to WWII operas were mainly given in the same language as the country in which it was performed. Would it suffice to say that non-Italian singers singing Italian repertoire are null and void as a consequence? These works were meant to be heard as popular hits, in as many different approaches possible. The question of style, and what’s right and what’s not is a tricky conundrum to get into. Stylistically and musically, Gruberova has a specific aim in mind in how she approaches her bel canto roles. Let’s start with her capping high notes. In many of her earliest documents, she took them according to tradition, sprung-up to the way generations of coloraturas had before her, on a wordless “Ha-Haaaaa,” or “Ah-Haaaaa.” Take practically any coloratura soprano you can name, and the majority of the high notes will be taken in this manner. As her career furthered, however, Gruberova began departing from tradition and doing things in her own way. She has stated publicly that as interpolated high notes were not written by the composer, that if they are inserted, they must signify the “emotional release of the character.” One of the notable features in Gruberova’s approach is that she often sang the capping high notes on the text of the scores, seldom resorting to the traditional method I described above. Wordless high notes were rarely taken by her. Then there is the nature of her coloratura passages. Gruberova is dead-set against any kind of aspiration, which results in “ha-ha-ha-ha,” nor breaking up a line with a catch-puff of air likewise; she seldom broke full passages up in sections (her miraculous breath and dynamic control affords her this luxury). Very rarely too, will she change the vowel, or drop the word in a difficult passage by resorting to a wordless “ah”—the most comfortable vowel to use in coloratura singing, as well as in her high notes. She believes that if vowel formation, along with tonal placement, is correctly utilized, an alteration in order to do a note in any region of the range is not necessary (her vowels are some of the most pure amongst opera singers). One of the features of Gruberova’s singing that, apart from ornamentation and decorations, is how scant few alterations and changes she makes to the scores in order for her to make a particularly difficult passage easier for her. Which brings us to the term “puntatura,” which I first learned in Phillip Gossett’s peerless book, Divas and Scholars. As he describes it, “Puntature, on the other hand, are required exclusively to assist a singer in performing passages that are awkward for his or her voice or that pose problems of breathing and syllable placement. Such puntature are frequently required in modern performance, and singers, conductors, scholars and critics should not flinch before them.” Following that, Gossett gives a number of examples in which singers do take, reasonably, a number of traditional puntature (I highly recommend this book, by the way: it is a must-have in learning about Italian performance practices). That established, Gruberova takes the fewest of puntature amongst the legions of coloraturas, both historical and modern. In the majority of cases, she will always take the most difficult option—which is to follow as closely as possible in what and how is laid down in the score. That is not to say that an aspirated note never slipped in from time to time, nor a passage been divided up with a catch-breath, or a mis-timed breath never happened. The intent, and the success of the results prevailed as a rule. And what of the repeated claims of “scooping” and “squeezing” to the upper interval? This is a more complicated issue. I “grew into” Gruberova’s art from early on, and that these features of her singing were often denoted in a negative way didn’t occur to me until I was informed as such, much later on. What others hear as scooping or sliding, I hear as portamenti, in varying degrees. Gruberova herself has a firm belief in keeping the line with the strictest legato possible, and that means generally connecting to the upper note in like fashion, whether in a slow or a fast melody (but there are plenty of instances, when called for, where a high note is attacked right in the center without a booster note). Her desire to maintain that strict control of the line of a phrase will sometimes result in a portamenti being overly oily or broad; and occasionally squeezed, or the tone may begin very “straight” and be devoid of vibrato . I believed this is derived in part from the tastes in “German-type” singing (an extreme example being Teresa Stich-Randall). Too, Gruberova has come into criticism for coloratura that some term as “slithery,” or notes being too bound together rather than articulated distinctly from one another. This stems from her desire to avoid the kind of choppy, rat-a-tat-tat, often aspirated passagework that mars florid singing. She believes in *carrying* the tone, along with the proper vowel as laid down in the score, in the connecting series of notes. To use an example: the “Ah bello a me ritorna” from Bellini’s Norma has nearly every soprano discarding the words near the end of each section of the cabaletta by resorting to a kind of aspirated “Ho-ho-ho-ho” disfigurement that makes no sense in any sense. The singer is effectively dropping the text, therefore the meaning, of the dramatic and musical statement. It has always been Gruberova’s intent to make her music *mean* something other than just for purposes of mere technical display. All of these considerations in Gruberova’s work are rarely, if ever noted by musicologists and critics in reporting and reviewing. Gossett was the first musicologist in my experience to even bring up the term puntatura. She has her own sound, her own style, her own method, uninfluenced by anyone preceding her. The kind of manner that is immediately recognizable as being hers, and hers alone. She does her coloratura in her own way, her high notes in her own way, phrasing, nuances, musical and textual choices; these are all the hallmark of an individual artist. Below, I will offer a selection of examples to illustrate what I outlined preceding. To my mind, this is the very definition of expressive bel canto singing. In this, Elvira is in her delirious “mad-happy-sad” state, and she is imploring Arturo to come back and return to her. This performance I would characterize as being done with “controlled abandon.” Gruberova is noting scrupulously what is written in the score, but underlining the text with artfully bent phrasing. It is in the second verse, though, where the bel canto magic happens. Here, she takes a number of ingenious decorations, which besides being impeccably delivered, actually impart the scattered madness of the character; a textual-musico pause, or a decorated drawing-out of word emphasis, a straightening of the tone, a series of ascending trills, staccati, and at one point in the middle, a vault up to a high E-flat. It sounds almost improvised, yet it is artfully skillful; it is anything but mechanical and “proper,” but freewheeling, spontaneous, and vividly effective as both an emotional and musical characterization. This happens when a technique is of an ultra-completeness; it allows the existence of choice. The most remarkable moment, though, comes at 3:30. Here is where the soprano is made to do a series of rising, descending chromatic scales (top of page 188 in the Ricordi score). The word on these sets of scales is “riedi,” which means “returnest” – Elvira is begging Arturo to return to her. So far, Gruberova is the only one, in my listening research, who uses the word “riedi.” Does this improve the meaning of the phrase? Possibly. Without the word, what do these scales mean? Were they instigated solely for purposes of display? Or maybe Bellini was characterizing Elvira’s mounting urgency and desperation, in her imploring pleas for Arturo to return to her? Taking Gruberova’s approach is worthy of consideration, but by no means can it be considered the ultimate way. Yet her declining to take the traditional puntature opens up a possibility of bringing meaning to the phrase (and the descending chromatic scales are fabulous). In this same clip is the traditionally taken concluding E-flat. It is sung on the word in the score, “amor.” As done here, it is not just a high note, but a climactic statement of emotion. It is bound to the preceding phrase, not conspicuously isolated and “set up.” An aficionado, though, used to the traditional way of springing up in the familiar manner, might describe Gruberova as “scooping” here. Because she does lift up – “ah-AH-ah-mor.” Here, most sopranos do it “Ah-HA-ah-mor,” or some variation on that approach. Hence, the way Gruberova does it to ears practiced in hearing it in the usual way, it sounds alien. Her choice is defined by her belief in an unbroken, non-aspirated legato (The entire performance is available on DVD, my top commercial recommendation of the opera on video) . Donizetti: Maria Stuarda, CD, Philips, Patané. This was one of the first recordings to record Gruberova’s tone sympathetically, and her performance is eloquent and deeply felt. Rossini: Semiramide CD Nightingale Classics, 1998, Panni. Though the performance has some cuts, it has four top-notch Rossini singers, in addition to Gruberova, Juan Diego Florez, Ildebrando D’Arcangelo, and Bernadette Manca di Nissa. Gruberova is not a Colbran-type Semiramide, but one where the role is adapted for a high soprano, and she makes the most of the dramatic aspects of the characterization. This is an incomplete list, one designated for “beginning essentials” for those wanting to investigate the best of Gruberova’s art. Her complete discography, audio and video, can be found at Gruberova.com. For the last installment of this series of 50th anniversary tributes, I will reveal and review my top overall favorite documented performance.